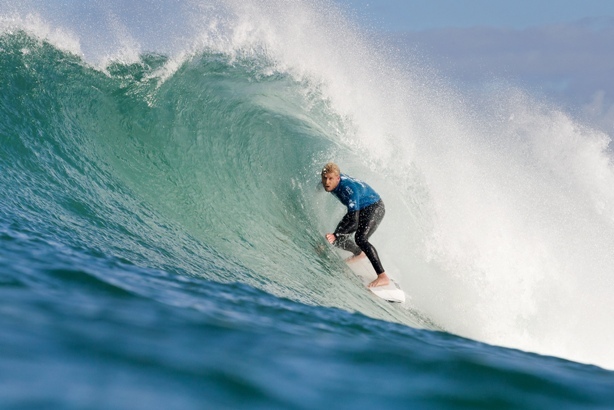 JEFFREYS BAY, South Africa (Sunday, July 19, 2014): Reigning ASP World Champion Mick Fanning (AUS) took a giant step towards a fourth title when he defeated compatriot Joel Parkinson in the Final of the J-Bay Open in sensational waves at Supertubes in Jeffreys Bay. Stop No. 6 of 11 on the Samsung Galaxy ASP World Championship Tour (WCT), the J-Bay Open enjoyed an excellent opening day of competition and great surf during the holding period before all the elements came together to produce an epic finale in pumping 6-10 foot (2-3 metre) hollow waves. Fanning was on fire from the outset of the Final, seamlessly threading together powerful rail work and deep tubes in the double overhead waves to rack up a 17.00 point total in the first half of the 45 minute encounter. Parkinson, the 2012 ASP World Champion and like Fanning a previous two-time winner at J-Bay, fought his way back into contention with rides of 7.43 and 6.17 but was still looking for 9.57 points when time ran out. Parkinson was gracious in defeat and equally complimentary about the quality of the surf at Supertubes. Matt Wilkinson (AUS) was eliminated by Parkinson in the first Semifinal when the eventual runner-up posted a an 8.83 and backed that up with a perfect 10 point ride to leave his giant-killing compatriot needing to replace both his scores. Wilkinson, who had previously dispatched 11-time ASP World Champion Kelly Slater (USA) in Round 3 and 2007 J-Bay winner Taj Burrow (AUS) in the Quarterfinals, fought back with a series of swooping turns on his backhand to earn a 9.77 but was ultimately still short of 9.07 points. In the second Semifinal Owen Wright (AUS) built on his victory over ASP World No. 1 Gabriel Medina (BRA) in their quarterfinal encounter, taking the early lead against Fanning. But the reigning ASP World Champion took control with rides of 7.17 and 8.0 before posting an excellent 9.00. Despite Wright earning a 7.23 to get out of a combination situation, he still needed a near-perfect 9.77 when the siren sounded. Legendary surfers Tom Curren (USA) and Mark Occhilupo (AUS) took to the water in front of an enthralled crowd at Jeffreys Bay for the first instalment of the ASP Heritage Series. The series is designed to celebrate and honour the foundational contributors to the sport of surfing by showcasing rematches between iconic surfers. Curren, a three-time ASP World Champion (1985, 1986, 1990) and Occhilupo, 1999 ASP World Champion and the winner of the first ASP event in J-Bay in 1984, did battle in the epic conditions. Curren posted a perfect 10 putting the Australian in a combination situation and even though Occhilupo took a final long ride down point he was unable to post the excellent scores needed to take win. The sixth stop on the 2014 Samsung Galaxy ASP World Championship Tour, the J-Bay Open, is webcast LIVE via www.aspworldtour.com. The website features plenty of images, heat reviews and the Heat Analyser video footage showing every ride during the event. Images from the event will be available from Getty Images. In addition a small number of hand-out images, as well as daily news feeds, will be made available for editorial use via our email distribution lists. Please contact kscholtz@aspworldtour.com (images) and srobertson@aspworldtour.com (news feeds) to be added to the lists. Jordy Smith will fly the flag as the sole remaining South African in the R5.4 million J-Bay Open after Round 2 was completed in small but perfect waves at Supertubes in Jeffreys Bay on Saturday. Smith dominated the opening day of competition held in 4 – 7 foot (2 metre) waves on Thursday, recording rides of 9.50 and 9.80 in the first five minutes of his heat and then going on to post the first perfect 10 point ride of the event. His heat tally of 19.80 out of a possible 20 was the highest on the WCT this year and saw the 26 year-old Durbanite advance directly to Round 3. There Smith will be up against C.J. Hobgood (USA), the 2000 ASP World Champion, when competition resumes. Travis Logie and Dylan Lightfoot, the only other Saffas in the event, were both eliminated in Round 2, finishing in equal 25th position overall. Logie (Durban), rated No. 24 on the WCT coming into Jeffreys Bay, placed third behind heat winner Kolohe Andino (USA) and Julian Wilson (AUS) in his opening encounter. He was unlucky to draw his teammate and travelling companion Frederick Patacchia (HAW) in Round 2 and the Hawaiian dominated in the barreling conditions on Saturday. Jeffreys Bay local, Lightfoot, 19, earned a wildcard into the J-Bay Open by winning the JBU Supertrial presented by RVCA at Supertubes in June. He was pitted against top seed and 11 x ASP World Champion Kelly Slater (USA) and Australian rookie Mitch Crews (AUS) in Round 1 where he placed second behind Slater. Lightfoot’s opponent in Round 2 was current ASP WCT No. 1 Gabriel Medina (BRA) and, despite selecting the best waves during the 30 minute encounter, the series of powerful and innovative manoeuvres performed by the rankings leader saw the South African bow out. A drop in swell size on Sunday and the prospect of better waves later in the holding period, particularly towards the latter stages next weekend, prompted the organisers to call a lay day for Sunday. Warm sunny conditions, light winds and inconsistent one metre waves drew hundreds of spectators to the contest site. They lined the natural amphitheatre created by the aloe covered dunes to watch the world’s best surfers fine-tune their equipment and their repertoire of manoeuvres in the head-high waves peeling down the rocky point. Waves 4 Water, an ASP supported program that provides clean drinking water to disadvantaged communities worldwide, drew plenty of attention to their demonstrations of simple but highly effective water filtering equipment. The organisers will meet again at 7 a.m. on Monday morning to decide whether to get Round 3 underway. The sixth stop on the 2014 Samsung Galaxy ASP World Championship Tour, the J-Bay Open, is webcast LIVE via www.aspworldtour.com The website also has news, images, video footage and a Heats on Demand section where every heat run to date can be replayed. Baker displayed the consistency that saw him reach the final in all the BWWT events last season, winning two of them, by again advancing through Round 1 and the semi-finals held in heaving 25 to 40 foot (8 to 13 metres) surf to reach the last six in the final at Peru’s renowned big wave venue of Pico Alto, 60 kms South of Lima. Rothman’s “go-for-broke” approach throughout the contest paid off and the young Hawaiian showcased his commitment, strength and confidence as the surf grew in size during the day by netting the highest scores of the entire event in the final. The six-man final boasted a “who’s who” of the global big wave community with reigning world champion Grant “Twiggy” Baker (ZAF) leading Greg Long (USA), Gabriel Villaran (PER) Shawn Dollar (USA) and Anthony Tashnick (HAW) into the brink, but it was newcomer Rothman that came out on top, announcing himself as a major threat on the BWWT. He also finished third in his semi-final, behind Rothman and Long, progressing to the final where he waited patiently and caught arguably the biggest wave of the entire event. However Baker could not find a second score and placed fifth overall. 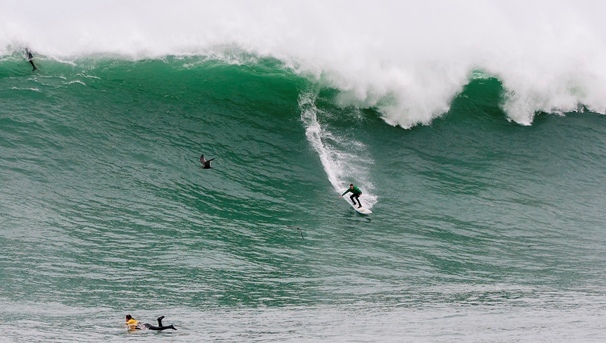 A new father, Rothman left straight from the hospital to hop on a plane and travel to Peru – a risk that would pay off in a career-changing win for the new family man as well as an ignited fervour in challenging for the big wave crown. The 2014/2015 BWWT season is divided into Southern Hemisphere and Northern Hemisphere components hosting three possible events within each. The Southern Hemisphere window runs from April 15 to August 31, 2014 with event options in Chile, Peru and South Africa. The Northern Hemisphere window runs from October 15, 2014 to February 28, 2015 with event options in Mexico, the Basque Region of Spain and Maui.